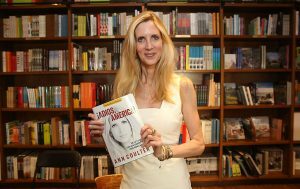 The publisher known for its books by conservative authors including Ann Coulter, David Horowitz and Laura Ingraham, among others, has decided to cut ties from The New York Times and its Best Sellers list, a popular measure of literary commercial success. Regnery Publishing said this week that it will stop using the Times’ weekly rankings to to market its books, and its authors will no longer receive special bonuses for making the list. The company says it will use Publishers Weekly’s ratings instead. “As a conservative publisher, we believe that the Times’ list does not represent national sales of conservative books as accurately as other widely-published bestseller lists,” Marji Ross, the president of Regnery Publishing, said in a statement. The company pointed to one of its books, “The Big Lie: Exposing the Nazi Roots of the American Left” by Dinesh D’Souza, as an example. Regnery said it was ranked seventh on the Times’ list, while Nielsen BookScan, a media data provider, ranked it first. The New York Times pushed back, saying its goal is to accurately reflect best-selling books. “The political views of authors have no bearing on our rankings, and the notion that we would manipulate the lists to exclude books for political reasons is simply ludicrous,” New York Times spokesman Jordan Cohen said. The New York Times says it determines its best seller list by compiling survey data from thousands of booksellers. Nielsen BookScan, whose measurement Regnery says ranks its books higher, instead counts print sales in stores representing about 85 percent of the market.